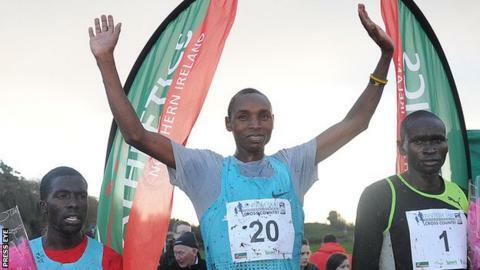 World champion Japhet Korir will be aiming to achieve back-to-back wins when he returns to compete at the Antrim IAAF International Cross Country event at Greenmount on 14 March. Korir, 21, won last year's men's race in Antrim when he became the first defending World Cross Country champion to run in the Northern Ireland event. The Kenyan is hoping to retain his world title in China in late March. Korir became the youngest ever men's World Cross Country champion in 2013. The IAAF opted to make the World Cross Country a biennial event after the 2011 championships. Korir had to battle hard to hold off 2013 Antrim winner Thomas Akeyo of Uganda in last year's Greenmount men's race. Other top Africans are certain to join Korir in the event which will be held concurrently with Athletics Northern Ireland's staging of the Home Countries International event. This year's Antrim event is taking place in March as opposed to its regular date in the early weeks of January. The international cross country event has been staged in Northern Ireland every year since 1977 apart from 1979. This year is the Northern Ireland federation's turn to host the Home Countries event and financial constraints mean they have opted to stage the two events together in the middle of March. However, the intention is for the Antrim International event to revert to its regular January slot in 2016. This year's athletes will be competing for a prize fund of just under £10,000 with £1,650 going to the men's and women's winners.